3. Done, a new brush group named 'deevad-v6' will be created. This is Deevad's brushset version 6 done for Mypaint version 1.1.0.
what you want with it. mentioned at the end of the article, 30 october 2012 . - une idée sur une dispo de cette nouvelle version de mypaint sous ubuntu ? Nous connaissons bien les précédentes versions et on vous le dit tout net, la seule beauté de vos icônes suffit à donner envie de dégainer le stylet. Mais quand en plus, les outils virtuels sont fidèles aux outils réels... Bref, c'est du pur bonheur que vous nous offrez là et on ne peut que se demander pourquoi ne pas l'inclure par défaut au future MyPaint 1.1.0 ? Thanks dude!!! Your brushkit is awesome! Comme toujours du pur bonheur ! Awesome. I can't wait to try out the updated set up brushes. thanks a lot gissehel for portin it back for mypaint 1.0.0.
bonjour, as tu une idée de la date de disponibilité de Mypaint 1.1.0 pour windows ? Hi, David! Thx for you brushes, I always use them. Forgot to ask. In previous version of Krita was several variants of cursor (like brush outline, cross, etc), but I can't find it in 2.5.2. It is there or that option was deleted? Do you use krita 2.5. and the 2.7 version simultaneously on your system? @Andre : I use the Git version only for Krita ; speed enhancement are really good. gissehel, thanks for the porting! Works just fine! David, thank you for the brush kit itself! However, yes, I saw that you changed the settings, but nevertheless it behaves so different to the previous version that I still don't know if there is a bug or not. Just to make it sure: Is that brush supposed to react to speed? Because it always does this litte stars (don't know how else to explain this). The old version was blurry when you were drawing very slow and looked like stars when you were drawing fast. At V6 speed doesn't matter anymore. Is that the way it should be? I really prefer the <V5 artpen over the new pen. It's just the way that I sketch that lends more to a dark thin line than a light gray. If I were going over my lines a lot, I would prefer the new pen... but I like to put things down in one stroke, and it doesn't look good for that. That's my only gripe; the rest of these brushes are great. Could we maybe see the return of the artpen in V7? Though I got this long time after, I will try. GIMP 2.9.x+ has supported loading Mypaint brushes. Thin_watercolor is the Version-2 of the brush, can not load! I have converted it to Version-3 of the brush, hoping to replace it. If a Mypaint brush can't load in Gimp; the bug should be reported to them. Thanks for taking the time to convert this preset. Maybe this fixed preset will interest Gimp team as well. I guess you talk about 3.1.2 ? How to define the default eraser ? I have a Wacom Intuos2 tablet, it works with wacom_serial5 driver and patched linuxconsoletools/inputattach and blacklisted wacom_serial4 module. When I switch from the stylus to the eraser, the default kneaded eraser is selected, but I don't like it. I want the thin hard eraser. I deleted all the references to kneaded in the *.py and *.pyc files in the /usr/share directory, and replaced them with thin_hard, but the new eraser does not come up after restarting MyPaint. It seems the old one is hardcoded. Is there a way to edit the default brushes before I have to hack the source ? - with the same eraser tip/position ; select the hard eraser brush of your choice in brush preset list. - when you'll flip again to eraser ; the eraser tip will 'save' in memory your last selected eraser with eraser tip: the hard one. yes, I saw that you changed the settings, but nevertheless it behaves so different to the previous version that I still don't know if there is a bug or not. Just to make it sure: Is that brush supposed to react to speed? Because it always does this litte stars (don't know how else to explain this). The old version was blurry when you were drawing very slow and looked like stars when you were drawing fast. At V6 speed doesn't matter anymore. Is that the way it should be? Hi unfortunately, your observation are right. When Mypaint moved from GTK2 to GTK3 ; the core engine also received changes. I never really could adapt to it. The refresh rate on screen seems always 'off' to me and my brush settings were affected as you comment. 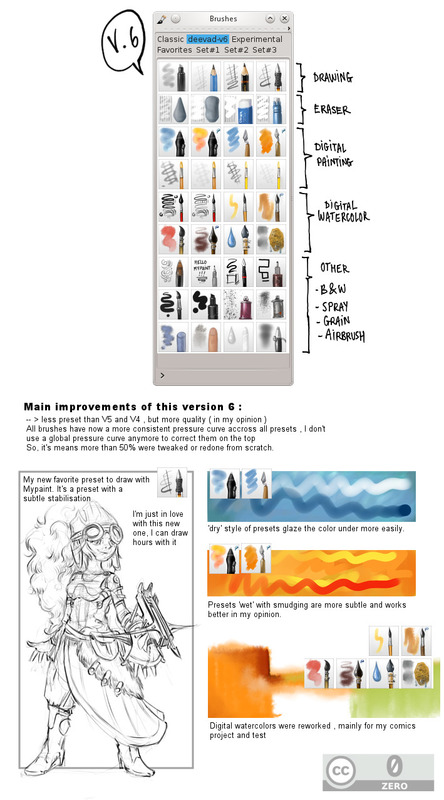 That's in this period I decided to migrate full workflow to Krita; even if Mypaint had better smudge/mix engine. Since this time, I'm still 100% in Krita. Sometime, I keep building from sources on my operating system an old GTK2 version of Mypaint. I hope the recent version will find back what made the old one great! Where is the download link in deviantart?